Vinedale students are lucky to have the opportunity to play a variety of instruments. 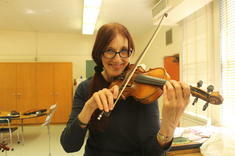 Our conductor visits once a week and teaches students about their instrument as well as how to play it. Students are able to borrow their instruments from school. Our orchestra is composed of: Strings (violin, cello), Woodwinds (flutes, clarinets) and Brass (trumpets). Students learn and practice throughout the year in order to perform in a concert at the end of the year.